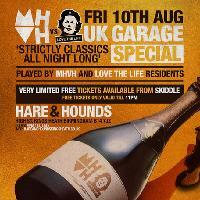 MHVH & LTL return for another UK Garage special, with residents playing the classics all night long. This event has already happened! UK GARAGE SPECIAL - FREE ENTRY! RESIDENTS PLAYING STRICTLY CLASSICS ALL NIGHT LONG! FREE ENTRY BEFORE 11PM WITH A TICKET FROM SKIDDLE / £5 THEREAFTER. HAVING A TICKET DOES NOT GUARANTEE YOU ENTRY, AND ADMITTANCE IS GRANTED ON A FIRST COME FIRST SERVED BASIS.